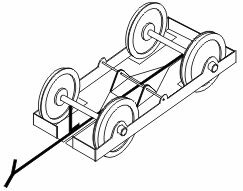 Carriage Compensation Unit specifically to make the GWR Dean 6ft4in wheelbase broad gauge bogie. The pack contains two frets (one illustrated), enough for two bogies, one coach. � Ability to compensate for changes in vertical track alignment and any degree of cant. � Enhanced stability of vehicle body and bogies. � Free running to allow scale length trains to be hauled. It consists of an etched brass 'outside bearing' subframe which will accept standard bearings and suitable wheelsets. The CCU is mounted on the coach underframe using a press stud which is supplied. This arrangement allows the bogie to be attached and removed easily. Alex Jackson couplings may also be fitted. To finish the bogie the modeller must provide bearings, appropriate wheelsets, springs, axleboxes and 'volute' springs. The 'W' irons are part of the CCU. 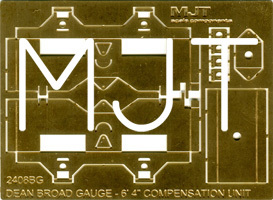 Brass Pin Point bearings - waisted (MJT 4009) and shouldered (MJT 4010) - are suitable for use with this CCU. A fuller description of this item is given in the assembly instrucuions which can be downloaded here.